A synesthete tells us what it’s like to be fluent in the dead language of childhood. 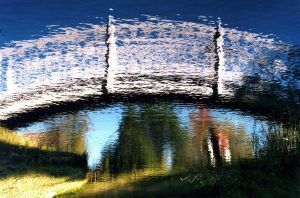 Marcia Smilack is a fine art photographer who has exhibited her work in galleries and museums around the world. She also happens to be a synesthete. She has lectured extensively both here and abroad about her creative process. I was 6 years old the day a long truck pulled into our driveway to deliver our piano. I can still taste the hot chicken noodle soup I was eating that winter afternoon as I listened to the two moving men roll the piano into our house. The moment they were finished, I raced into the living room, where I beheld my family’s new acquisition: an upright piano made of blond wood, polished to a sheen that was matched in brightness by its ivory keys. I reached out and touched a random white note when to my utter astonishment, an image appeared outside my face, a few inches above my eyes. It arrived so quickly it startled me into a state of wonder. What I saw was green, but not just any green. It was the green of shimmering light held within the loose confines of a rectangle with diffuse edges. The vision disappeared at exactly the moment the sound receded from the room, but not from my memory. Indeed, I consider it a seminal experience, and the first in a collection of permanently preserved memories that do not change in any way over time, that stay permanently ensconced in the present time of the experience, every detail intact. The first time I heard the word “synesthesia,” I was in a laundromat where I believed I was alone, perhaps explaining why I was dancing with abandon to the percussion of the dryer, when to my mortification, I turned around and saw a woman had been watching me for some time. “I believe you may be synesthetic,” she pronounced. She was a graduate student in psychology who had read about synesthesia that week in school. “I may be what?” I asked. She said something about sound and color resonated. Synesthesia is a neurological phenomenon that some people are born with, but you can call it a gift, a talent, or a super ability, in which more than one sense “goes off” at the same time, from the same single stimulus. “Colored hearing” is one of the traits of synesthesia I possess. Some scientists believe that it results from “crossed wiring” in the brain. They hypothesize that in synesthetes, neurons and synapses that are “supposed” to be contained within one sensory system cross to another. Researchers are not sure why this happens, but some believe that these crossed connections are present in everyone at birth, and only later are the connections refined. Adult synesthetes may have simply retained these crossed connections. The language I call the “dead language of childhood” refers to my picture language, which came before I was verbal, and has stayed with me ever since — perhaps it is my original native tongue. I see everything I experience, from bodily sensations to concepts, as well as my word language learned at a few years old. When I named it “the dead language of childhood,” I was alluding to a theory that a scientist proposed that everyone might be born with synesthesia but lose it by the time they are 3, as the brain “prunes” unnecessary associations, and that synesthetes, in contrast, retain those connections all their lives. (Some scientists disagree, and say you either have synesthesia or you don’t.) In some studies, infants respond to sensory stimuli in a way that researchers think may involve synesthetic perceptions: An infant cannot yet distinguish between Mommy and smell and taste and touch — sensory experiences at that age are as one and have not yet become differentiated. (Researchers Daphne and Charles Maurer have said, “If we could visit the newborn’s world, we would think ourselves inside a hallucinogenic perfumery.”) So in my case, I have two languages in my mind’s eye at all times: one made of pictures and one made of words. Synesthesia has been known about forever (Pythagoras, for one, described his own synesthesia). Many well-known artists (Kandinsky), musicians (Ravel), writers (Nabokov) and scientists (Richard Feynman and Nikola Tesla) have written or talked about their own synesthesia. But because so few people have it, scientists considered it statistically insignificant, and saw no point in studying a trait that didn’t affect the larger population. And maybe people just assumed the synesthesia of these gifted artists and scientists was just their particular brand of brilliance. But with the advances in PT and fMRI scanning , which can detect activity in the brain, scientists could see that synesthesia was real — see, for example, that the visual cortex actually lights up in a synesthete like me, for whom sound elicits imagery and color, or for a grapheme synesthete, for whom each letter of the alphabet has a distinct color that never changes throughout a lifetime. As a kid, it never occurred to me that everyone did not perceive as I did — but why would it? LIke most synesthetes of my generation, I have had a string of embarrassing moments when I didn’t know why what I said received such an odd reaction. After enough of that, I didn’t talk about it any more. I think friends from childhood remember me as having an extraordinary memory (which I still have — they called me “the memory bank”), and one friend still talks about how good I was at math — speaking of which, I didn’t tell anyone that I saw calculus solutions to math problems in green; it never seemed like something to mention. The renowned researcher V.S. Ramachandran devised a brilliant study to prove synesthesia. He asked four synesthetes and a control group to locate, on a page with many 5s, three 2s that were randomly mixed in. Whereas it took nonsynesthetes several minutes, the synesthetes found them immediately. “The green triangle right there,” said one, because for him number 2 is always green. I thought of the single word that should always be included in defining synesthesia (at least it helps some understand) — it is an “involuntary” experience. You cannot bring it on, it takes you (me) by surprise, just appearing as sound or imagery or whatever — but it is 100 percent involuntary. That said, in the ’60s, when people dropped acid, some said they had similar experiences, which scientists named “pseudo synesthesia” because once the drug wore off, so did the synesthesia. I was in Madison, Wis., in the ’60s (the Berkeley of the Midwest), and while I am sure I’d be exaggerating if I said I was the only student who never partook of drugs, there were few among those I knew. One night my roommate came in after a “trip” and said, “You should really try it; you don’t know what you’re missing — you can hear the sound of colors.” To which I thought, “So? I already do that,” and at that moment, decided I would never do drugs for fear it would make my natural responses go away. Synesthesia is part of how I perceive — but not the whole part. I’m an artist and a writer as well as being synesthetic. I taught myself to use a camera when I was nearly 40 years old. In the years leading up to that, my creative and intellectual life had always been focused on words. A compulsive reader since early childhood, I got a Ph.D. in English literature, during and after which I taught college for several years. But because there were no tenure-track jobs available, I began to work as a freelance journalist. I took a break from teaching to begin work on a serious book about the Vietnam War, which turned out to be a dangerously depressing subject for me. By chance, I also acquired a camera the first summer of this new endeavor, expecting to use it only for fun when I took breaks from the painful hours I spent researching and writing on my subject. 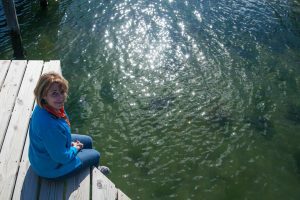 Taking photographs, particularly of reflections on water, buoyed my spirits and gave me a new outlet for the creativity that had previously expressed itself through words. 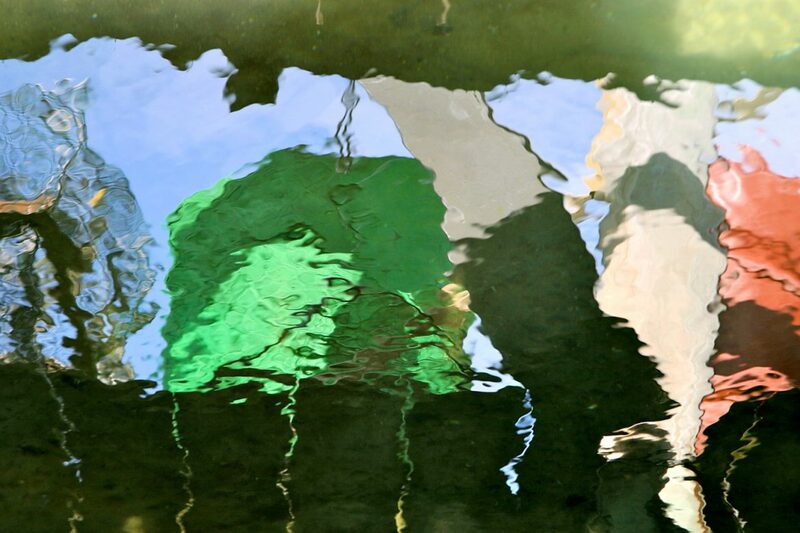 I had no training in either photography or visual art, but I was living on the water in Menemsha and had noticed that when I looked at reflections on water, I heard sound, the reverse of my original “green note” on the piano. I decided to trust what I “heard” in my mind’s eye as reliable signals that pointed out my decisive moments. 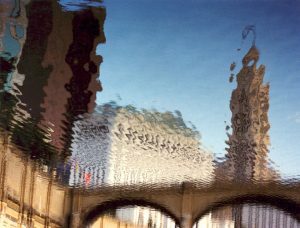 I began to photograph reflections exclusively and soon after, named myself a Reflectionist. I use the surface of the water for a canvas. I rely on wind for my brushes, and I let the time of year and the setting provide my palette. I walk along the edge of the water and look straight ahead; I do not look at the water directly. I walk until something in my peripheral vision makes me turn around as one does at the unexpected sound of a siren, though in my case, it is a siren no one else happens to hear. As soon as this happens, I stop, then step back, and walk into the moment a second time; then, when I feel the impulse to turn around to see what just called me, I walk toward the source of my distraction. Once there, I put my camera to my eye but choose not to focus. I prefer at this juncture to look toward my subject with blurry vision. I know to click the shutter when what I am looking at produces sound, a sensation of motion or the feeling of texture against my skin, although it has nothing to do with “knowing” in the usual sense. Rather it is an intuitive knowing, a felt awareness brought to my attention by my synesthetic responses, which I think of as messengers that arrive faster than thought to deliver a single message I always heed: Beauty is lurking. The fact that I discover my subjects when I investigate the source of my distraction made me wonder about synesthesia as it functions in my perceptual life. I wondered if in order for synesthesia to take place, it might be necessary for me to not become overly focused. If so, how ironic that a person must be in a partial state of unawareness in order to become the most aware.